Over the years, Megan worked with clients across numerous industries ranging from small start-ups to billion-dollar businesses. 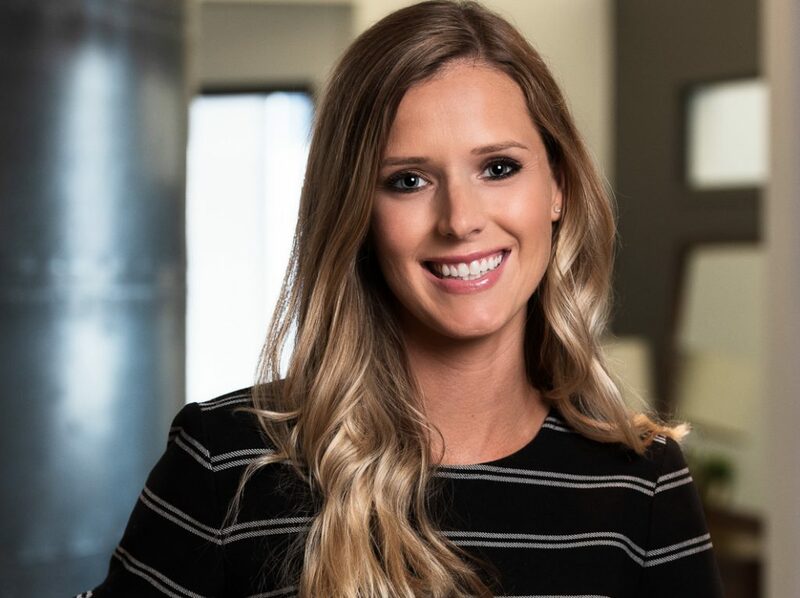 Megan started at Dittoe PR as an intern nearly 13 years ago and at just 26 years old, became Vice President and Partner, making her the youngest leader in the history of the company. In her day-to-day role, Megan manages client strategy and success, but as VP, she is also tasked with cultivating a thriving company culture that attracts new talent and retains existing employees. My PR career basically started by accident. My senior year of college, I was assigned a project in my careers class to create a resume and cover letter for an internship I was interested in. I woke up in the middle of the night before the project was due in a panic, realizing I had forgotten to do it. I got online and started searching for an internship with a Midwest-based PR agency and stumbled upon a posting from Dittoe PR that sounded perfect. I turned in the resume and cover letter for the assignment, and while I wasn’t required to officially apply for the position, I decided to go for it. And here I am nearly 13 years later. I love working with such a talented group of PR pros who all bring different skills and experiences to the table. We have team members who understand the ins and outs of every social media platform, others who are brilliant writers, some with amazing design abilities, several who can get national media attention in their sleep, and the list goes on. Everyone, regardless of their time in the industry or at Dittoe PR specifically, has knowledge to share to help our team grow. I also value building relationships, both personally and professionally, with my clients. I want our clients to see Dittoe PR as an extension of their own team, not just an outsourced agency. I want them to trust me just like they would a friend. These personal relationships are what motivates me to do the best job possible for every client. This is a really PR geeky answer, but I love Critical Mention, the TV clipping tool we use. And Todoist is life-changing for task management. Slack is an amazing tool for communicating internally and with clients. In addition, I subscribe to several PR industry e-newsletters, including Bulldog Reporter and PR Daily News Feed. From a company perspective, I’m proud of the small group meeting format we recently started. We received employee feedback that we should continue to look for ways to enable more collaboration amongst the entire team. Everyone on our team has knowledge and experiences to share, and we don’t want to limit opportunities for learning to just those we share accounts with. In 2019, Dittoe PR shifted from a one-to-one mentor format to small group meet-ups to make learning more collaborative. What else is new at dittoe? Recently, Dittoe PR invited Katara McCarty, an organizational coach, speaker and author, to lead us on a six-month journey toward building a stronger company culture through unified personal and professional development. We dove right in by creating a fresh set of core values that define who we are and the principles that direct the way we do business, as well as a vision statement that guides our internal decision-making. 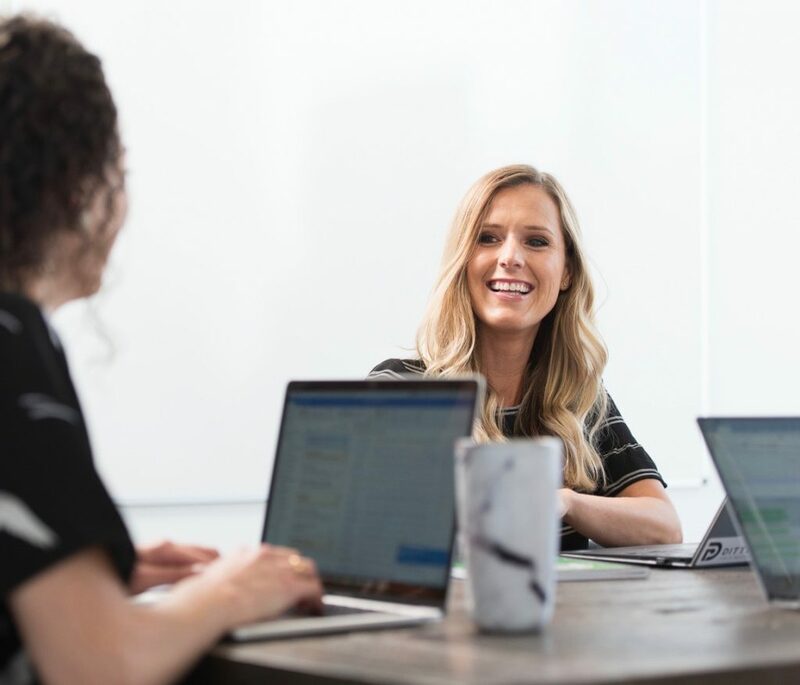 After crowdsourcing input from employees about Dittoe PR’s culture, the team collectively crafted four core values – or mantras – that we firmly believe in and practice daily to support each other, our clients and Dittoe PR as a system. After we established the values and vision, we hired a local muralist to install a piece of art in our main conference room that visually represents our values and vision. The mural is made of wood and aluminum textures with pops of color and has truly become a conversation piece when hosting current clients, prospects and potential new hires. It’s something our entire team is proud to show off, and we love sharing who we are as an agency. We just hosted a Valentine’s Day pitch in with wine and snacks, and the entire team brought in apparel for a big clothing swap. All remaining clothes, more than 10 garbage bags full, were donated to a local women’s shelter. We also just wrapped up our first quarterly small group collaboration sessions. Each group went off site and shared insights and knowledge the rest of the team can benefit from. We try to keep things light around the office whenever possible. 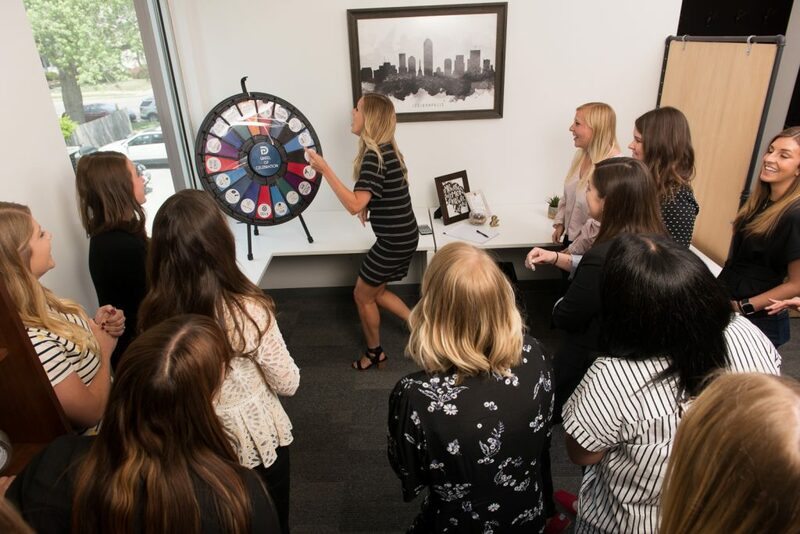 We have a “Wheel of Celebration” that every employee gets to spin on their work anniversary, with the potential of winning up to $500. We also host Wine Wednesdays, Friday breakfasts, book club and more.
" Counter the self-defeating voice in your head with truth talk – you are talented, and you are always improving." You’re absolutely right. I find myself often talking about the level of stress PR professionals face every day. Clients can be demanding and media can be challenging, and I think a lot of PR pros are their own worst critics – we’re all wired similarly. Being in PR is like riding a roller coaster: you get to experience the highest of highs and lowest of lows. You can start a day feeling like you’re amazing at your job, and within hours, feel like you aren’t cut out for the job. You definitely have to be prepared to hear “no” a lot and deal with clients and media members with vastly different personalities. But the good far outweighs the bad. I will say that with time and experience, you start to toughen up and develop thick skin. You also learn to laugh, even in a crappy situation. If you don’t, you’ll go crazy. But it’s important to trust yourself and know that you are an expert of your craft. You have knowledge and experiences that even the most successful of business leaders may not possess. Counter the self-defeating voice in your head with truth talk – you are talented, and you are always improving. The 2012 BMW Championship was the biggest men’s golf tournament to be played in the Indianapolis area since the 1991 PGA Championship. Our team worked around the clock, pouring energy into our media relations and community engagement initiatives for the tournament. Throughout our efforts, we collaborated often with the communications team at the PGA TOUR. They were incredible to work with and learn from. The tournament arrived, and while energy was high, it was an exhausting week due to inclement weather that caused a lot of communications challenges. One day, the vice president of communications for the PGA TOUR asked my colleague and me to follow him out of the media center — where we spent the majority of our time — and down to the course. As we approached the course, he lifted up a rope, ushered us underneath, and the next thing we knew, we were standing just feet away from Tiger Woods and Rory McIlroy as they teed off on the first hole of the tournament. We then got to walk inside the ropes, near two of the greatest to ever play the game, while they finished the hole. It was an overwhelmingly amazing experience that was made possible because our contact at the PGA TOUR recognized our hard work and tremendous results. It was an experience I’ll never forget and will always appreciate. In the end, Dittoe PR garnered more than 1,000 pieces of media coverage and more than 1 billion media impressions for the BMW Championship, and it was named the 2012 Tournament of the Year. How about a moment you'd rather forget? This isn’t a strategy I recommend, but as a young PR professional, I pitched a national media outlet for an important client. One of the reporters emailed me back with a simple “no,” which every PR pro hears numerous times daily. I honestly don’t remember why, but I accidentally replied “BOOYA!” to the reporter and was instantly mortified. A few email exchanges and apologies later, he actually ended up covering the story he initially declined. I’m a full-time working mom with two little boys, Remy (age 4) and Rowen (age 2). Like every other career-focused mom, I am in a constant battle of feeling like I’m never giving enough: to my job, my family and even friends, which are all incredibly important to me. For me, success is when I perfect the work-life balance that everyone always talks about. I want to be 100 percent focused on work when I’m at the office or with a client, and then dedicate myself to my family when I’m home. I also want to maintain a social life with my friends who keep me sane. It’s not easy. PR is an around-the-clock job, as is being a mom (ha! ), but I feel my best when I’m juggling work, family and friends in the best way possible. I am so blessed to work for an agency that puts family first and is as flexible as a company can be with its employees! You can spend all the time in the world pulling media impressions, ad value equivalencies and various figures to measure the impact of your efforts, but at the end of the day, even millions of impressions don’t outweigh words of praise from a client. When a client goes out of their way to thank you and show their appreciation, that lets me know that our efforts are truly successful. And when they refer business our way, I know that means they trust Dittoe PR and know we’re the best at what we do. "When I started my career, I always told myself that I may not always (or ever!) be the smartest person in the room, but I will outwork anyone. My work ethic is something I do have control over, and no one is going to work harder than me." In 2019, we’ll continue to see public relations, content marketing and social media become increasingly aligned. PR and marketing professionals will find ways to better integrate these three functions, as they are more powerful combined than standing on their own. When properly coordinated with a content marketing strategy, PR plays an integral role in helping an organization educate and engage its audiences while building third-party credibility. Social media is a great medium for amplifying those PR and marketing messages. As always, it’s not about shoving self-promotional material down your audience’s throat. It’s about delivering value, and Dittoe PR is evolving to meet these shifts for our clients. Outside of work, I am always with family and friends. I love drinking wine and unwinding with the people who know me best. My happiest place is wherever my kids are. I enjoy reading (just finished “Becoming” by Michelle Obama and LOVED it), going to the gym and volunteering for the Humane Society of Hamilton County. I’d want 22-year-old Megan who is just starting her internship at Dittoe Public Relations to know to hang in there. If PR doesn’t immediately feel like the career for you, don’t throw in the towel. Stay with it, and really give it a chance. Don’t sweat the negative replies from reporters, stressful deadlines or rude emails from clients. Just keep working hard because it’ll pay off down the road. When I started my career, I always told myself that I may not always (or ever!) be the smartest person in the room, but I will outwork anyone. My work ethic is something I do have control over, and no one is going to work harder than me. It’s also important for young people to note the role of internships once you’re starting out in this field. Nowadays, it takes an internship to get an internship – so it’s important to start early. As early as possible, start thinking about career opportunities and do everything you can to get hands-on experience, whether it’s through unpaid internships, volunteer opportunities or professional networking groups. We’re hiring! Dittoe PR has an immediate opening for an account executive position. Apply here.